The University of Helsinki changes its provider of security services. 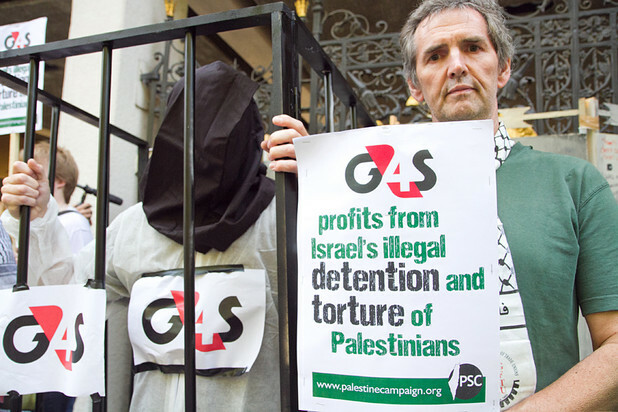 The previous provider was G4S, widely criticized for its alleged human rights violations in Palestine/Israel and elsewhere. This can be considered a victory for the campaign that had demanded that G4S be kicked out of the University of Helsinki. I feel happy. I am not in the position to make any official statements about the reasons behind my university’s decision to discontinue relying on the services of the G4S. The previous contract was over, G4S was bidding for a new one and lost the bid. Nevertheless, I believe it is clear that our campaign had an impact on the process. Let me briefly remind you of some of the moments of the campaign. In April 2014, there was a petition signed by people from across a range of faculties and positions at the University of Helsinki, asking the University of Helsinki to discontinue using the services of G4S. The petition was initiated by Syksy Räsänen and me. As a response, the rector Jukka Kola commented in Twitter that the university will look at the issue. In June 2014, the biggest academic union of our university stated its support for the petition. In February 2015 the Student Union of the University of Helsinki expressed its support for the petition. As of June 2015, there will be a new company, called Turvatiimi, that takes care of the security services of our university. This decision means that the name of the University of Helsinki will join the list of universities such as King’s College London, University of Southampton, University of Oslo and University of Bergen that have decided to take distance from G4S. While it is difficult to track all the reasons behind all the cases, in all universities there was a campaign against G4S. The company has been accused of complicity in serious human rights crimes, for example against children in Israeli prisons. The campaign at the University of Helsinki did not take any more general position on academic or other kinds of boycotts related to Israel. The campaign was targeted around one company, on which there was enough evidence of its involvement in human rights violations so that a relatively wide constituency of concerned teachers, staff and students could express its concern. It was also interesting to note that within the moderate media attention our campaign received, it was not only the more activist-oriented media but also outlets such as the web newspaper of the conservative Kokoomus party that highlighted our petition. We sometimes used the claims of the University of Helsinki to be globally responsible in our campaign. In my experience, as I was repeatedly in contact about this issue with the leadership of my university, their way to handle this case always seemed professional. Even if I have repeatedly criticized the leadership of my university for various things, and probably will continue to do so in the future as well, in this case I am happy to congratulate them for the decision. The Israel Football Association appealed to UEFA president Michel Platini on Friday to speak out against the Palestinian bid to vote the IFA out of FIFA next week. The annual FIFA Congress, which begins on May 28, includes the Palestinian Football Association's proposal to suspend the IFA from world football. IFA president Ofer Eini told Platini in a letter that FIFA had twice refused his request to have the Palestinian bid removed from the Congress agenda, mentioning FIFA's own attempts to have the item struck. "IFA is facing one of its most crucial situations since it was established in the year 1928, finding ourselves in the need to defend ourselves against a proposal which is totally political and has nothing to do with the objectives of FIFA and the spirit of football," Eini wrote. 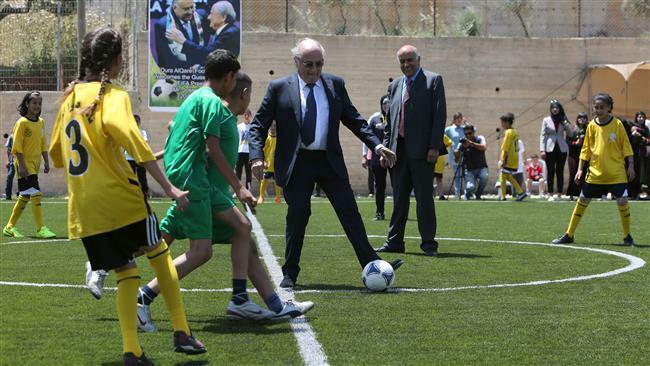 FIFA chief Sepp Blatter failed to convince the Palestinians to remove their proposal -- which he objects to -- during a visit to the region which ended on Wednesday. The PFA says Israel imposes restrictions on the freedom of movement of their players, and protest the existence of five Israeli teams in settlements, built on land they want for a future state. The IFA says it has no say over the security issues which can cause difficulties in players' travel within and from the West Bank, calling the Palestinian bid an unsportsmanlike attempt to mix politics with sports. Israel told Blatter it would set up mechanisms to ease the movement of footballers and set up a working group to monitor the situation. "The time has come now for UEFA to raise its voice loud and clear against this proposal," said Eini, whose IFA is part of UEFA. "UEFA should lead the world of football against this dangerous and totally unacceptable initiative of the PFA." Eini called on UEFA's executive committee to publish "a formal decision rejecting" the PFA proposal, requesting all UEFA members to take "legal or administrative steps" to strike down the proposal from the agenda, or unanimously object it, if it reaches the vote. Blatter is seeking reelection at the Congress. 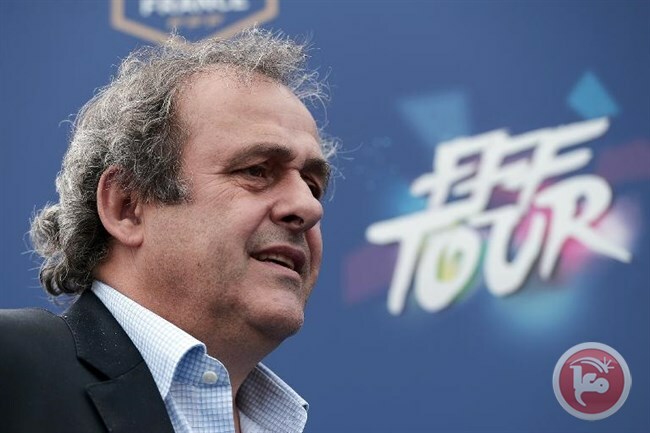 He has received strong public backing from nearly every regional confederation, except Europe's UEFA. Israel could face suspension at FIFA due to discrimination against Palestinian footballers. On Wednesday, a meeting was held between Palestinian President Mahmoud Abbas and FIFA President Sepp Blatter in the West Bank city of Ramallah over the issue. The Palestinian Football Association (PFA) says the Israeli regime imposes restriction on the footballers’ free movement. It also protests against the existence of five teams in the Israeli league that are based in illegal settlements built on occupied Palestinian land. The PFA also argues that the Israeli federation connives at racial profiling of the Palestinians. Blatter moved to settle down the dispute by initially meeting Israeli Prime Minister Benjamin Netanyahu and subsequently Abbas following a proposal by PFA demanding the suspension of Israel. PFA chief Jibril Rajoub said at a joint press conference with Blatter that the body would keep “the proposal on the agenda (of the upcoming FIFA Congress) for sincere and open discussions by the FIFA member associations." "There will be no compromising on free movement of our athletes and officials." 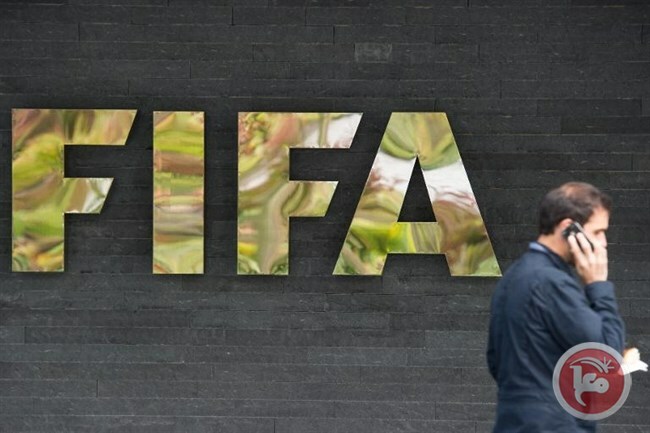 The matter is expected to be put to a vote at the annual FIFA Congress slated to be held on May 29. The Palestinians would need support from three-quarters of the 209-member FIFA for the proposal to take effect. Should this happen, the Israeli footballers would immediately lose the Champions League and Euro 2016. The Illinois State House of Representatives has unanimously passed a bill which will prevent the state's pension funds from investing in companies that boycott Israel. Illinois Governor Bruce Rauner has indicated he will sign the bill which passed the House on Monday by a vote of 102-0. The bill previously passed the Illinois State Senate unanimously at 49-0. With Governor Rauner's signature, Illinois will become the first state to legislate against the Boycott, Divestment, and Sanctions (BDS) Movement. The anti-BDS bill outlaws the state pension system from investing in companies that boycott the state of Israel. 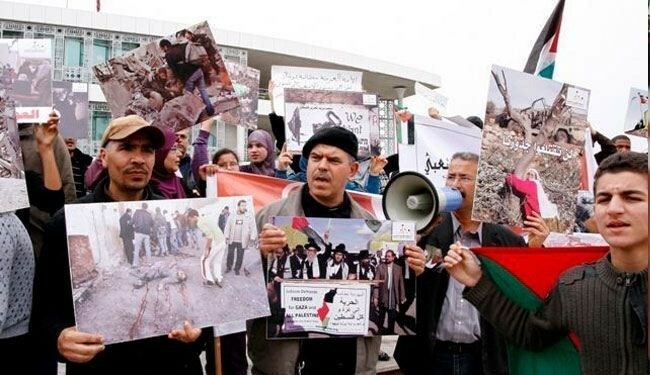 In 2005, Palestinian civil society called on the international community to stand in solidarity against the Israeli occupation with a campaign of boycotts, divestment, and sanctions (BDS) until Israel complies with international law and ends violations against Palestinian rights. In the decade since the BDS movement began, a global response to Israel's system of Apartheid has emerged with significant results. In a tweet Monday, shortly following the bill passing the Illinois House, Gov. Rauner wrote: "Looking forward to signing #SB1761 making IL [Illinois] first in the nation to fight BDS against Israel." 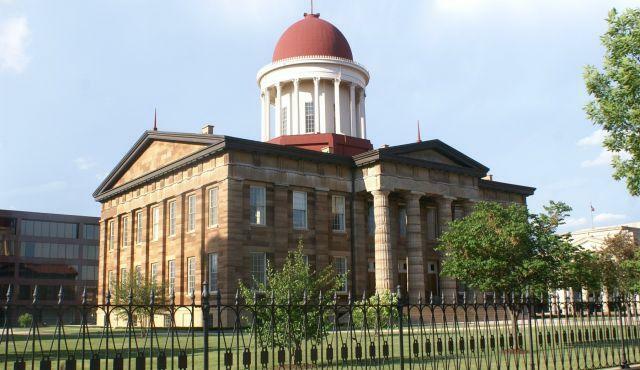 Israeli lobbyists in Springfield, Illinois' state capital, have successfully conflated the BDS Movement with anti-Semitism. In numerous statements issued by Illinois legislators about the anti-BDS bill, there has been an echoing of Zionist propaganda which equates boycotting Israel with prejudice against Jews. One of the main Zionist leaders in Illinois, president of the Chicago Jewish United Fund, Steven Nasatir, recently said, "At the core of the BDS movement is a quest to delegitimize Israel as a sovereign, democratic, and Jewish state." Mr. Nasatir continued, "This bipartisan legislation sends a strong message that Illinois will not tolerate such efforts." BDS proponents have responded to the Illinois bill by stating that this anti-BDS legislation proves the success of the BDS movement. The organization Jewish Voice for Peace has released a statement entitled, "Criticism of Israel is not anti-Semitism," citing an open letter from hundreds of academics calling on the U.S. State Department to revise its definition of anti-Semitism. JVP's press release states that over 250 members of their Academic Advisory Committee have signed an open letter to the State Dept. asking for a revision of its definition of the term anti-Semitism so that the charge of anti-Semitism may not be used to silence critics of Israel. This style of conflation which categorizes the BDS movement with demonization of worldwide Jewry has been used to gather support in Illinois for the anti-BDS bill. Anti-Palestinian activists rely on such laws to silence supporters of the movement to hold Israel accountable for its treatment of Palestinians, further illegal colonization of Palestinian land, and violation of Palestinians' human rights. Once Illinois' Governor Rauner signs the anti-BDS bill into law, Illinois will be the first U.S. state to enshrine such legislation. However, a number of anti-Palestinian lawmakers in the U.S. Congress are closely monitoring the Illinois bill's success as a model for a similar federal law. The Indiana and Tennessee state Legislatures have both previously passed non-binding resolutions opposing boycotts of Israel. Sousse Court of Appeals, in northern Tunisia, postponed on Monday the appeals trial submitted by a Tunisian travel agency against a previous court’s order that banned two of its tripsto Jericho and occupied Jerusalem last month to next Monday. On March 16, a Tunisian court has set a historic precedent that effectively criminalizes any normalization of relations with Israel and ruled that two planned tourist trips to occupied Jerusalem by a Tunisian tour operator should be cancelled. The lawsuit was filed by an anti-Zionist Tunisian organization, better known as Qawim, against the travel agency it accused of attempting to "normalize relations" with Israel, by arranging trips to occupied Jerusalem. Speaking to the PIC reporter, Qawim's lawyer Nadia al-Warghi stated that the travel agency defended its planned trips saying that the PA leadership is one the record to encourage such visits from Arab and Muslim countries. The lawyer said the organizers of the trip would have to coordinate with Tel Aviv, and these actions would go against the Tunisian constitution that did not criminalize normalization with Israel, but it provided for the support of the just causes in the world and there is no more just cause than the Palestinian cause, according to her statements. The Tunisian constitution strongly prevents any communication with an enemy state, she added, pointing out that Israel has carried out a number of terrorist attacks and assassination operations on Tunisian territories. Tunisia will never be a breeding ground for normalization with Israel, she stressed. Al-Warghi called for intensifying popular presence in the next session scheduled to be held on Monday in order to prevent any normalization attempt in Tunisia. Israeli-Finnish relations are reported to be strained after Finland prevented the Jewish National Fund from participating in the exhibition of non-governmental organisations held annually in the capital, Helsinki, Israeli newspaper Maariv reported. The newspaper pointed out that the exhibition, which is funded by the Red Cross and the European Union, will be held next week and will focus its activity on both Africa and the Middle East. Maariv added that the Jewish National Fund had permission to participate in the exhibition, however it recently received a notice prohibiting it from joining because of "the existence of question marks on the legitimacy of its activities". In the wake of this, two Jewish organisations announced they would be boycotting the exhibition. Vice-Chair of ICAHD Finland (Finnish branch of the Israeli Committee Against House Demolitions) Syksy Räsänen, who campaigned for the JNF to be excluded from the exhibition, wrote on Facebook: "I am very satisfied with the decision as a victory for the BDS movement." The newspaper said the Finnish decision sparked anger in Israel. The Israeli ambassador in Helsinki spoke with Finnish officials in the foreign ministry, but they responded that "it is a private event that the Finnish foreign ministry has no impact on" despite the fact that the ministry is one of the sponsors. In the wake of the Finnish response, the Israeli ambassador accused Finland of anti-Semitism. Tension is brewing between Israel and Finland over the Finnish World Village Festival's decision to boycott the Jewish National Fund. The Jewish National Fund (JNF) in Finland registered to participate in the World Village Festival, an annual happening which focuses this year on development in Africa and the Middle East. The Israeli news portal nrg reports that several weeks following confirmation of its participation, JNF received notice from festival organisers that it could not participate “due to questions about the legality of its activities”. Israel's ambassador to Finland, Dan Ashbel, furiously contacted the Finnish foreign ministry, which stated that the World Village Festival is a private event over which the government has no control. Ashbel then decided to exploit Holocaust Memorial Day to launch an attack, claiming there is no difference between anti-Semitism and anti-Zionism. “The Holocaust was not a natural disaster”, Ashbel said during Finland's offical Holocaust Memorial Day ceremony, as reported by nrg. Ashbel, in the presence of Finnish President Sauli Niinisto, continued: “The Holocaust was based on a precise political decision of the Nazi regime. The headline 'Memorial Day for Victims of Murder', as it appears on the official calendars of Finland, is deceptive and misses the special nature of anti-Semitism. In these very days it was decided by organisers of the World Village Festival to boycott the Jewish National Fund. I understand that the existence of a Jewish state in the Middle East does not fit the world view of the conference organisers, financed by Finnish public funds. They therefore decided to believe the general accusations of people who oppose the very existence of the state of Israel, and to get rid of the bother. I wonder how such a scandalous decision fits with values such as environmental development, fairness, tolerance and the desire for peace. It interests me if the other organisations participating in the festival were requested to meet this same standard. 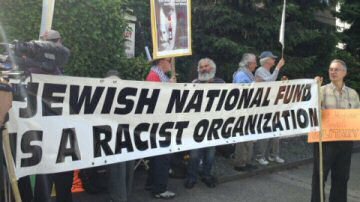 It is insufficent that the organisers announced they would agree to host the Jewish community, as there is no difference between anti-Zionism and anti-Semitism." Since 1995, the World Village Festival has been a free festival for the whole family. It describes itself as “open to all and a meeting place offering tastes of different cultures and surprises from all over the world”. The main organiser of World Village Festival is Kepa, an umbrella organisation for nearly 300 development organisations or other civil society groups working on issues concerning development and globalisation. Some 80,000 visitors attend the festival yearly. FIFA leader Sepp Blatter said Friday he hopes to head off a Palestinian call for a vote to expel Israel from football's governing body but that Israel must make a concession. Blatter said he will meet Israel's Prime Minister Benjamin Netanyahu and Palestinian President Mahmoud Abbas next Wednesday and Thursday in a bid to end what he called his biggest "challenge." The Palestinians have sought a vote at the FIFA Congress on May 29 claiming abuse of Palestinian footballers by Israel. Blatter has made it clear he opposes the vote but that "a solution is only a realistic proposition when those who are privileged are prepared to concede something and contribute to equality." The onus in this respect is on Israel with its outstanding infrastructure, fully functioning professional league and economic context," Blatter wrote in his weekly column for a FIFA magazine. In an interview with a small group of reporters including AFP, Blatter said Israel should make it easier for Palestinian and foreign footballers and sports equipment to get in and out of the occupied territories. He added that Netanyahu "would not receive the FIFA delegation if he is not ready to make some concessions, I am sure." "He knows the situation," added Blatter who has been trying to end the dispute for two years. Blatter said he would meet Netanyahu in Jerusalem on Wednesday and Abbas in Ramallah the next day. Palestine, which has been a FIFA member since 1998, wants world football's governing body to bar Israel from international competition over its restrictions on the movement of Palestinian players. It also opposes the participation in the Israeli championships of five clubs located in Jewish settlements in the occupied West Bank. The clubs play in the third and fourth divisions. The motion will need a three quarters majority to be passed at the FIFA Congress in Zurich.The FIFA president held his latest meeting with the heads of the Israeli and Palestinian federations in Zurich last Sunday. He said he hoped that after his talks with the Israeli and Palestinian leaders the federation hold new talks to find a solution before the May 29 deadline. "This is my challenge number one for my remaining time to the election. But it is a very delicate problem," said Blatter, who will seek a fifth term in a FIFA election also on May 29. He added that the case was making headlines "from South America to Asia." "There is so much pressure by social media towards FIFA to kick out Israel on one side and on the other side keep Israel in." Israel Football Association president Ofer Eini has accused the Palestinian federation of launching the initiative to score political points as the Palestinians seek greater international recognition. Blatter said that a successful vote would be a "dangerous" precedent that could get FIFA involved in other political and diplomatic battles. "It opens the door," he said. "We want to be in sport and not in politics. This would be a very dangerous precedent, we have to fight (it) but they realise that it would be a precedent." The former vocal leader of the Catalan group Ojos de Brujo, Marina Abad, had organized to perform at the Festival Méditerranée of Ashdod (south of Israel, next to the Gaza Strip) the upcoming 11th of June, next to other Spanish artists such as Tomatito, Diego Guerrero, Rycardo Moreno and Javier Limón. Marinah’s concert was part of the Idan Raichel Project, where the Portuguese António Zambujo will also perform. The Valencian artist had also planned to sing at the World Music of Tel Aviv. This important victory for the BDS has been achieved some days after the American singer Lauryn Hill (former singer of The Fugees) decided to cancel her concert in Tel Aviv, due to a strong international campaign asking her to not violate the call for cultural boycott launched by the Palestinian civil society in 2004. The artist didn’t disappoint us and decided not to sing for Apartheid. If we look at the sponsors and organizers of the festival, it’s obvious how they are closely linked to the violation of Palestinian rights. Among the sponsors there is Tfahot, a bank which finances illegal colonies in occupied West Bank; Ashdod port, which exports agricultural products produced in stolen land; Adama, a food company linked to the company Agan-Machteshim, which produces glass fibre in an illegal Jewish colony; and wide institutional support of the Jewish state (Ashdod Council, the Ministry of Culture of Israel and the National Lottery). Today we remember the Nakba. 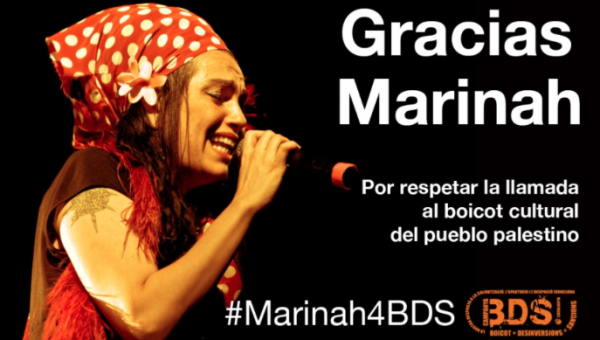 BDS Catalunya and RESCOP celebrate Marinah’s decision and we fully support her. We want to emphasize the importance of her decision, since she is the first Spanish artist to cancel a scheduled concert in Israel. Marinah has set an example of compromise, values and solidarity which we hope encourages the rest of Spanish and International artists to intensify cultural boycott against Israel. From BDS Catalunya and RESCOP we won’t stop calling for BDS until Israel: 1/ ends its occupation and colonization of all the Arab territories occupied in June 1967 and dismantles the Apartheid Wall; 2/ recognizes the fundamental rights of the Arab-Palestinian citizens of Israel to full equality; and 3/ respects, protects and promotes the rights of Palestinian refugees to return to their homes and properties as stipulated in UN resolution 194. More than 10,000 South African students marched, earlier today, in protest against Woolworths Stores' trade agreements with Israel. The #BoycottWoolworths protest was led by the Congress of South African Students (COSAS) in the Free State. COSAS represents school children in all 9 SA provinces and is arguably the largest school learner organization in the country. Click here for photos from today’s COSAS protest against Woolworths. The 15th of May was chosen for the protest to also mark the 67th year of the Palestinian Nakba “Catastrophe” (the 1948 establishment of the modern State of Israel that was the start of the displacement and oppression of the indigenous Palestinian people). Today’s protest march started at Thabong Community Center at 09h00 and ended at Goldfields Mall (where Woolworths store is located) in Welkom in the Free State. The protest, according to police estimates, drew between 10 000 and 13 000 young learners from various areas in and around the Free State province of South Africa. 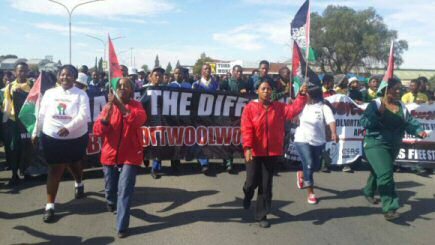 Further COSAS protests against Woolworths are due to take place in coming weeks in other provinces. 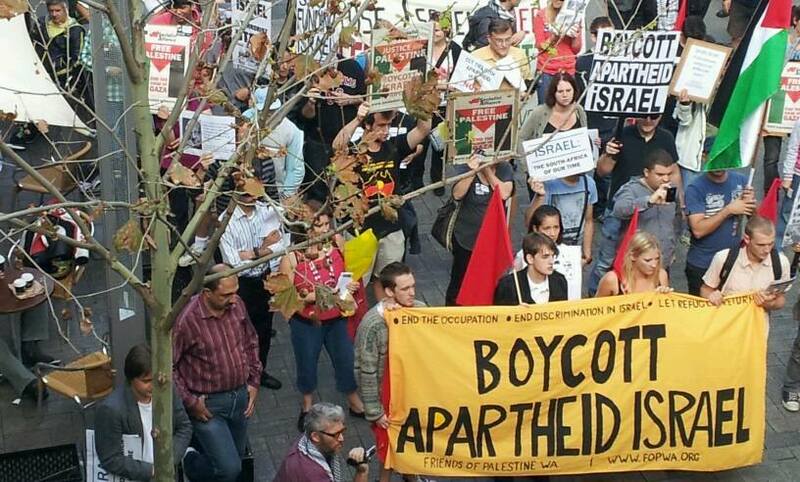 In August 2014 a call for the complete boycott of Woolworths until it ends its Israeli trade links was made by BDS South Africa, COSATU, ANC Youth League, MJC, SACP, YCL, SASCO, PSA, COSAS and various others including the National Coalition 4 Palestine (a coalition of more than 30 organizations, trade unions and other groups). An independent #BoycottWoolworths impact report by a Wits University researcher has found that Woolworths is losing over R30 million (close to R8 million per month) since the start of the BDS #BoycottWoolworths campaign. According to the report the actual impact “could be in the hundreds of millions”. Israeli apartheid week activities were launched in several universities of the US, in coordination by the Students for Justice in Palestine organization, which has branches in many American universities, on Wednesday. The action highlights the Israeli apartheid policies and daily human rights violations against Palestinians, in synchronization with the Palestinian Nakba (exodus) anniversary, on 15 May, 1948. According to a statement by the student activists in Justice for Palestine organization which PLO Department of Palestinians Expatriates Affairs received, the apartheid week will be organized in tens of American universities including Northwestern University, Delaware, Houston, New Jersey, New Orleans, New York and Seattle. Palestinian activist and entrepreneur at Students for Justice in Palestine, Omar Shanti, said that the event aims on exposing the dark Israeli history and systematic ethnic cleansing of Palestinians, in addition to the ongoing oppression and racism policies. The activity will support the Boycott, Divestment and Sanction (BDS) movement against Israel, in addition to seeking justice for Palestine and ending the Israeli occupation. Throughout the week, there will be several speakers and activists of different backgrounds and cultures to raise awareness of the issue. Workshops will be held on the Palestinian resistance through cultural heritage, poetry and arts around the world. Solidarity stands with Palestine will be conducted by setting checkpoints around campuses to explain the Israeli blockade, since about 67 Palestinian mothers between the years 2000-2005 had to deliver their babies on military checkpoints, leading to the death of 36 infants. The other purpose of the apartheid week involved the ethnic minorities in the US, and the struggle to be free around the world, to achieve justice and equality for the oppressed.